Today’s Post of the Day looks at a purse snatching case out of Nashville this past Monday in which the victim’s husband ended up shooting the thief. Wait a minute, isn’t the use of deadly force in defense of property unlawful? The facts as reported by Fox news are essentially as follows: the thief, identified as Jordan Ponce, 19, ran up behind and seized the purse of the 25-year-old female victim. She told police that when she declined to comply with the theft of her purse, the thief bashed her head against a wall. At that point, her 29-year-old husband heard the female’s screams and came to help. The thief fled and was pursued by the husband, who took the thief to the ground, where the two men struggled. The thief hit the husband in the head, at which point the husband shot him. The thief nevertheless managed to get into a vehicle, later discovered to have been stolen a short time before, and flee the scene. He would later be taken into custody and be in the hospital for treatment of wounds to his stomach and hands. So, good shoot, or not a good shoot? Here’s where the details matter, and given the lack of relevant facts we’ll have to explore several hypotheticals. One relevant question is at what point did the husband escalate to deadly force (bring the gun into play)? Certainly, the husband is entitled to use non-deadly force to recover his wife’s purse, and he’s probably legally fine as long as he limits himself to non-deadly force in that effort. Deadly force absent an imminent threat of deadly harm would not usually be lawful, however. True, his wife had been attacked rather viciously, but that attack was over when the husband began his pursuit of the fleeing thief. On the other hand, given the thief’s deadly force violence against the wife I suppose one might argue that the thief was a fleeing felon who was a deadly force danger to the community generally, especially in seeking to escape capture. “Fleeing felon” is never going to be the justification argument I want to be compelled to make in court. Separately, I can’t help but wonder who is caring for the potentially seriously injured wife while the husband is chasing down a purse thief who, even if caught, might be bailed out of prison before the wife and husband have gone to sleep that night? Another relevant question is whether the thief retained possession of the purse while he fled. So long as he did so the husband pursuing him was arguably still in the act of preventing the theft of his property. 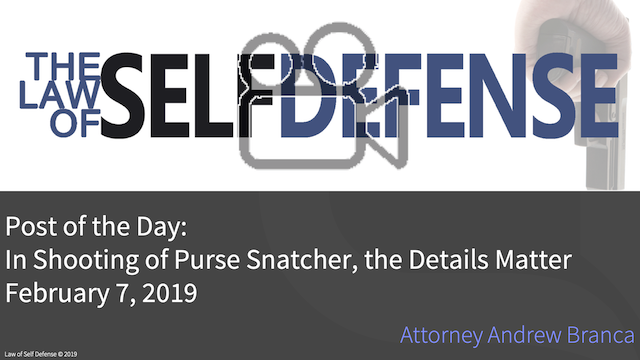 If the thief dropped the purse while fleeing, however, the defense-of-property justification goes out the window, and the further use of even non-deadly force by the husband could well be unlawful. Another question is the nature of the fight between the husband and the thief once they went hands on. The news report merely says the suspect “hit the husband in the head,” but it’s difficult to determine from that simple statement whether the husband was the subject of mere non-deadly force—which a bare-handed blow to the head would usually be, absent substantial aggravating factors—or deadly force. If the blow to the husband’s head constitutes deadly force, and it well might have, the husband going to the gun may well be a proportionate response. If the blow to the head constitutes mere non-deadly force, however, where is the justification for the husband to resort to deadly force? It’s also worth noting that it’s good for the husband that the thief survived the apparent gunshot wound, if only because it greatly mitigates his legal liability if his use-of-force turns out to be justifiable. If the thief dies, the husband is looking at murder or manslaughter. If the thief survives, any criminal charge is likely to carry a far lesser penalty. It goes without saying that in this narrative the thief is an exceptionally unsympathetic character, and the husband’s reactions to the attack on his wife are likely to be perceived as perfectly human and emotionally understandable. I imagine most of us would like to think that the authorities reviewing this case would tend to apply their discretion favorably towards the husband, and negatively towards the cowardly and violent, car-stealing purse thief. Very often that’s exactly what happens, and it wouldn’t surprise me at all if that’s what happens in this instance. It’s important to remember, however, that the application of this discretion is now outside of the husband’s hands—he is no longer in control of his own destiny. Ultimately it will be prosecutors—not the husband or his wife—who decide whether to test the husband’s use-of-force justification with a trial that could take years and burn through tens of thousands of dollars in legal fees—all with a real prospect for jail time in the end. Maybe those prosecutors will use their discretion in the husband’s favor. But perhaps not. It’s dangerous to assume that a prosecutor is going to be favorably disposed to your use-of-force, especially if that prosecutor either sees legal vulnerabilities in your justification claim and/or perceives a personal or professional benefit to charging you regardless. The factual questions raised above are precisely the kinds of issues a prosecutor would look at in determining the extent of legal vulnerabilities in the husband’s justification claim. Bottom line, I’m not telling you to not chase the guy who attacked your wife and stole her purse. I’m just cautioning that you make that decision in an informed way, and make sure the stakes are worth the risks.